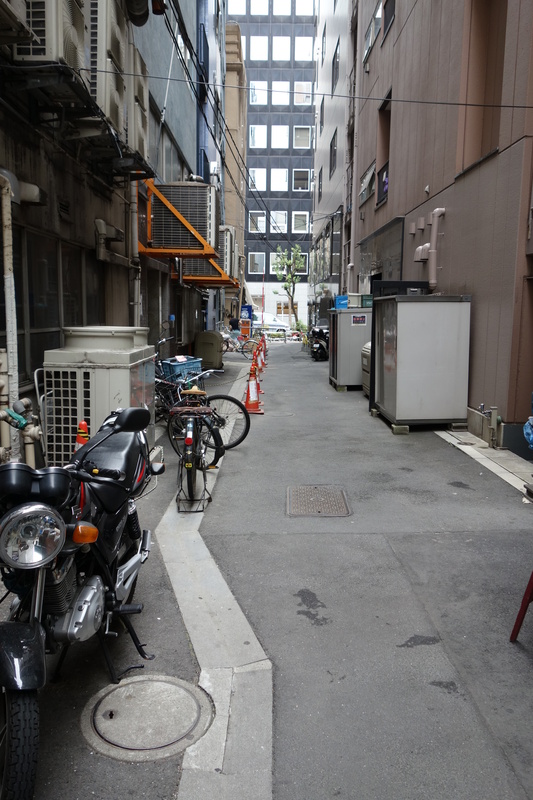 One more from the vaults. 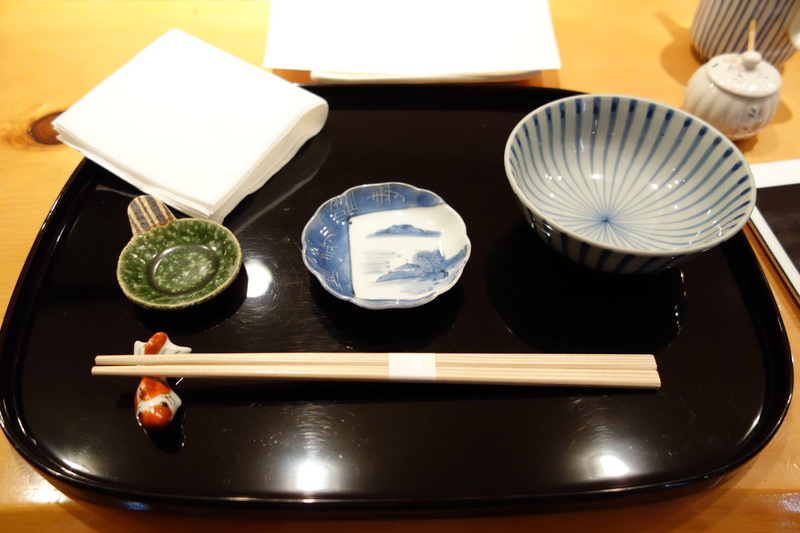 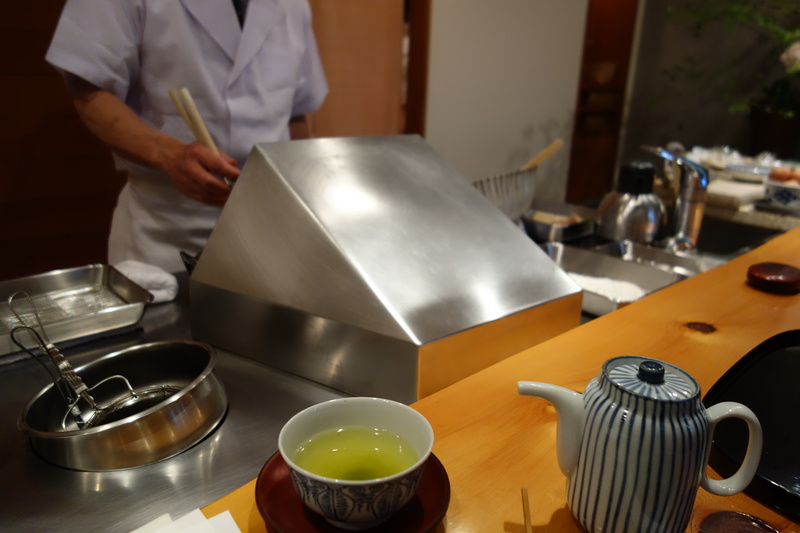 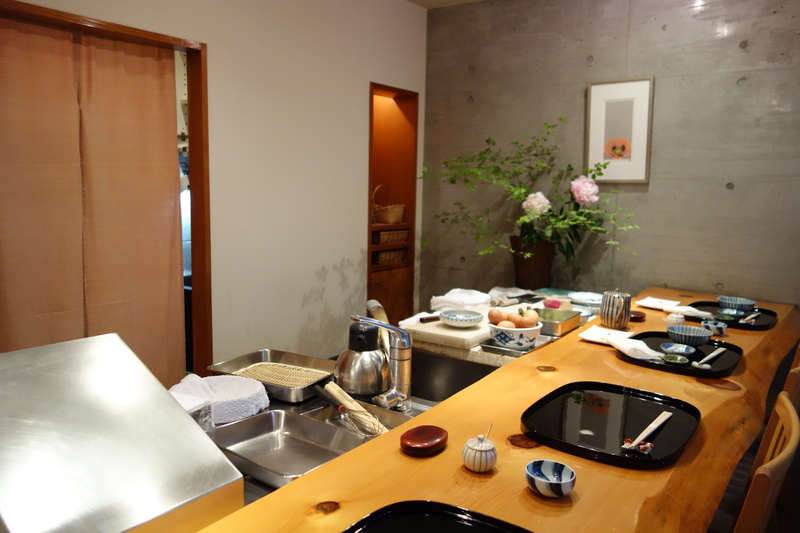 As I’m writing this in December 2013, the big news of the Michelin-starred tempura world is that 3-star 7chome Kyoboshi has been downgraded to 2-stars for the 2014 Guide. 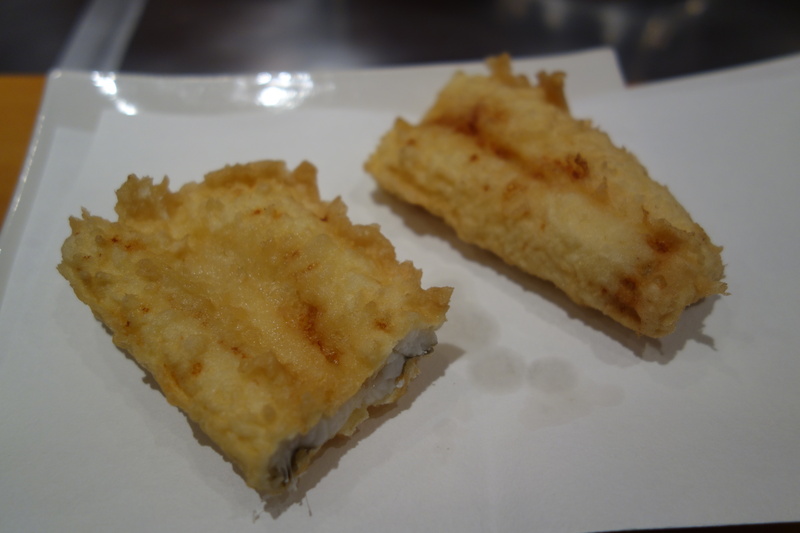 After two great meals at RyuGin and Tapas Molecular Bar, I decided to try a good tempura place. 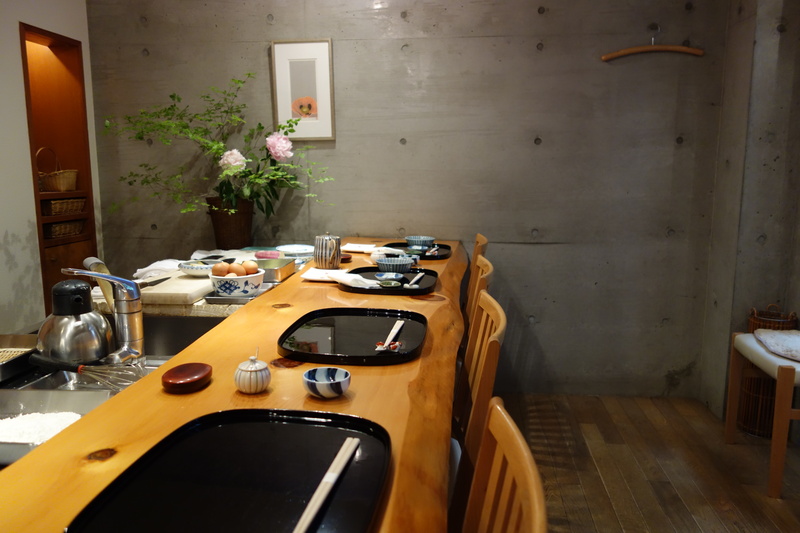 I had first walked into Asagi the day before, but the counter was completely full with businessmen during the lunch service, and Asagi-san told me to come back the next day. 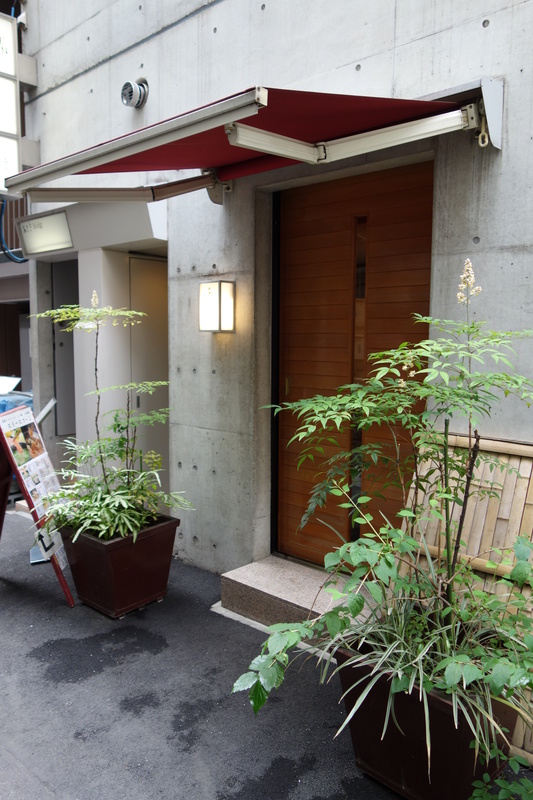 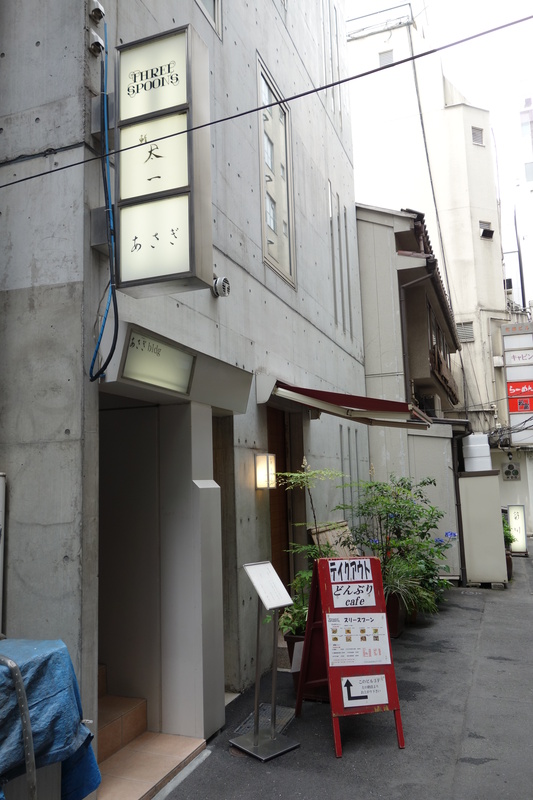 Asagi, his name-sake restaurant, is located in a narrow alley behind Ginza that I would have had a hard time finding without Google Maps. 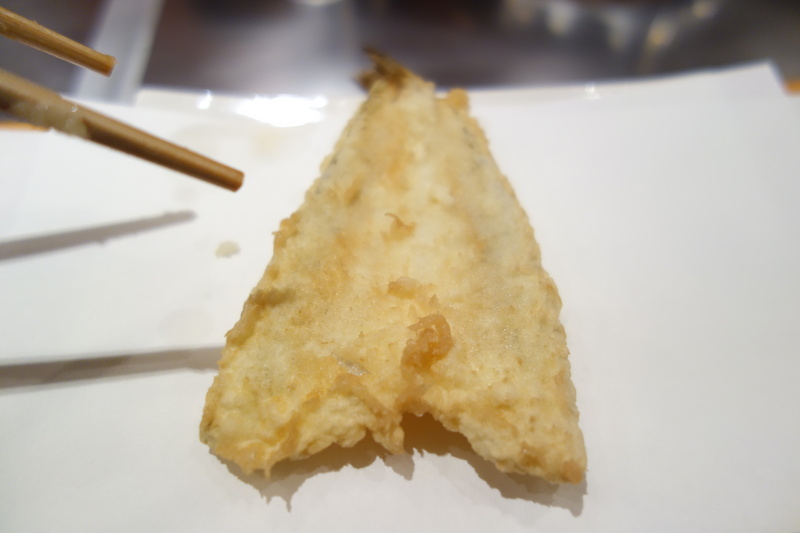 Asagi-san has been frying tempura for more than 40-years, and evidently the restaurant has flourished, because Asagi-san owns the entire building in which his restaurant is located. 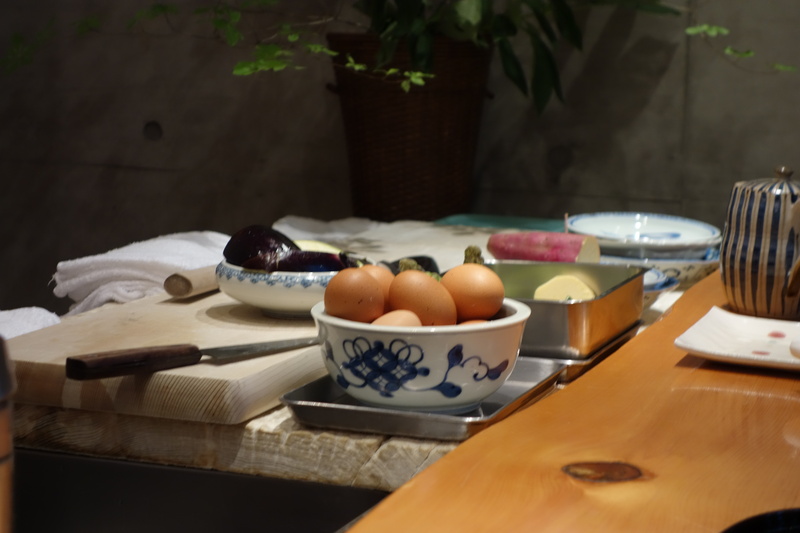 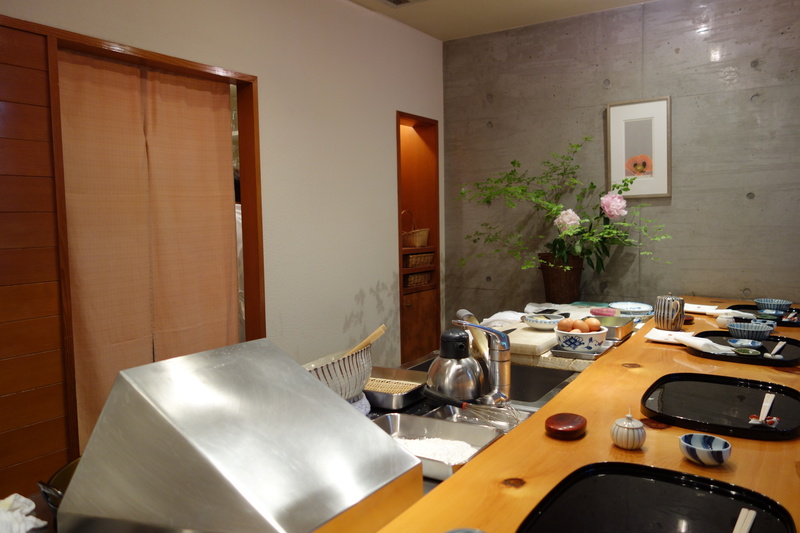 The small counter seats 8, and Asagi-san’s amiable wife serves as waitress. 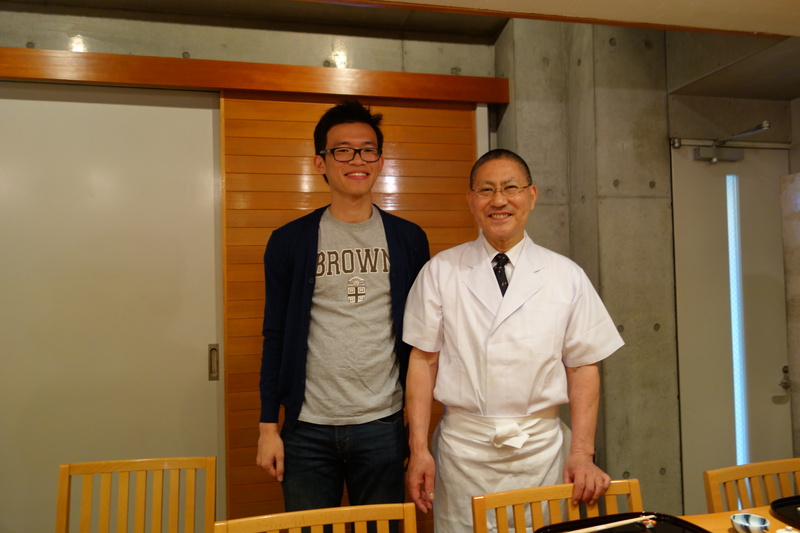 When I arrived on Thursday, in stark contrast to the day before, I was the only diner there for lunch service. 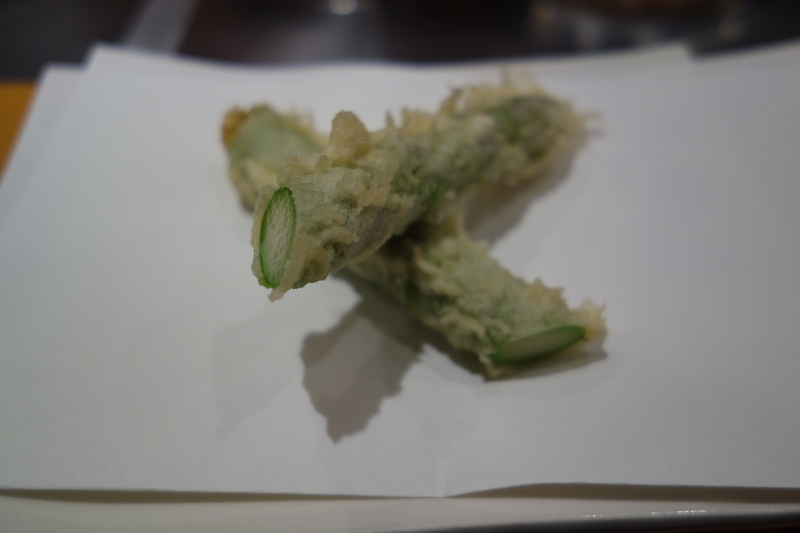 Throughout the meal, Asagi-san prepared all the ingredients in front of me, and he explained that since I was visiting in summer, it was a uniquely difficult time for tempura. 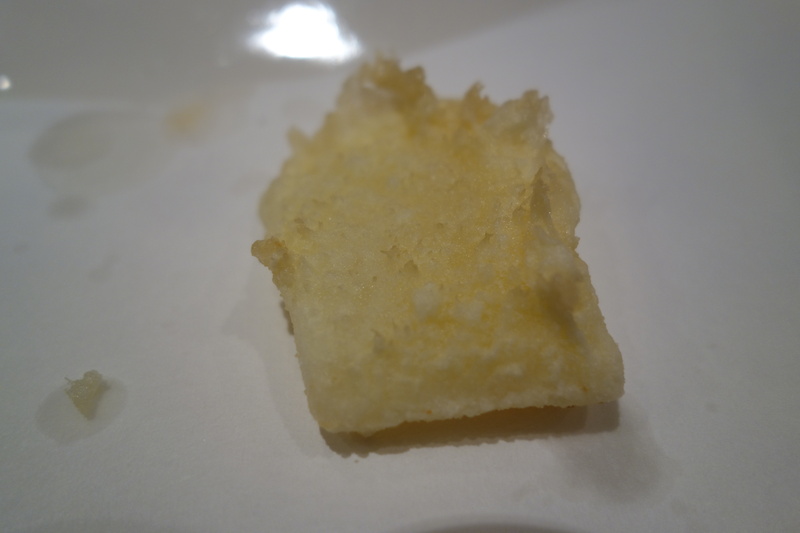 Summer’s high humidity makes it difficult for the batter to stick, therefore he changes the batter composition with each season. 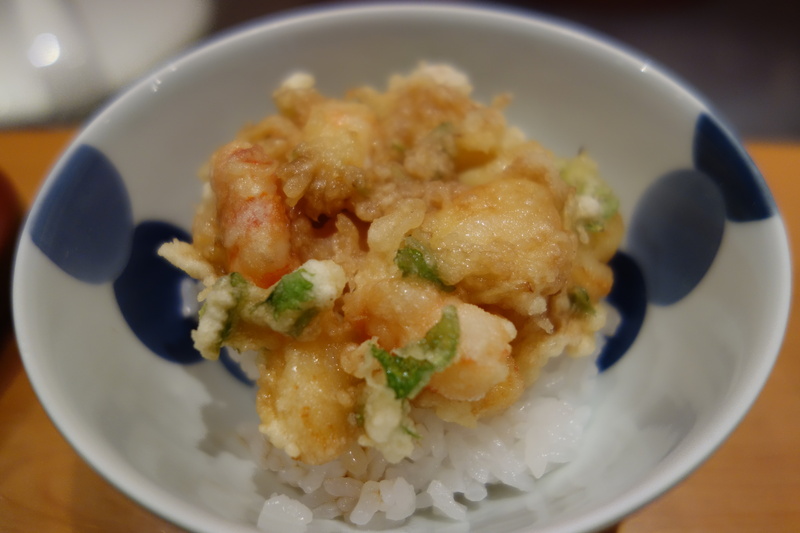 When my spoken Japanglish failed, I used Google translate on my phone to translate my queries. 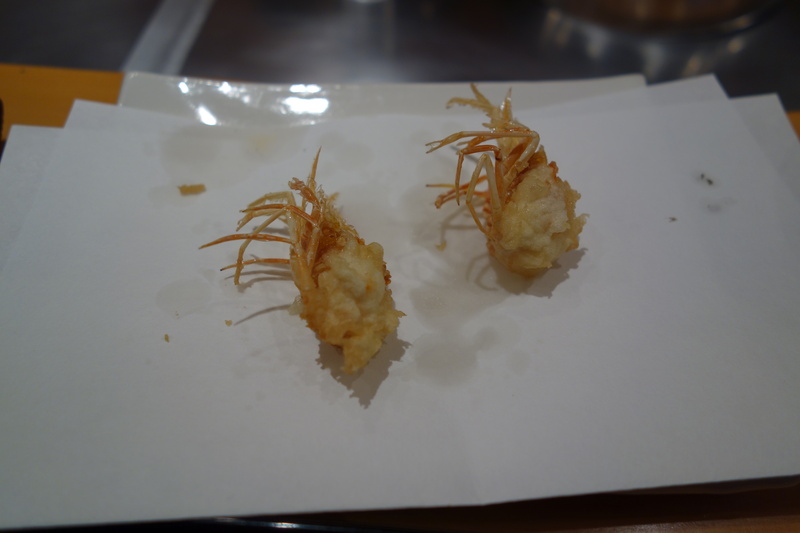 For a very reasonable price (around 8,000 yen), I could pick the mind of the tempura master for the duration of my entire meal. 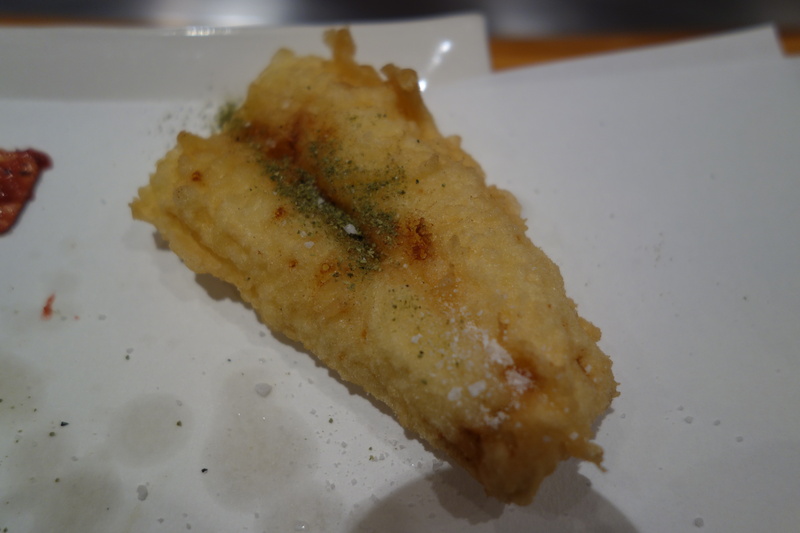 While it was a very high quality tempura meal, I learnt gradually through the meal that tempura as a category of food leaves me cold. 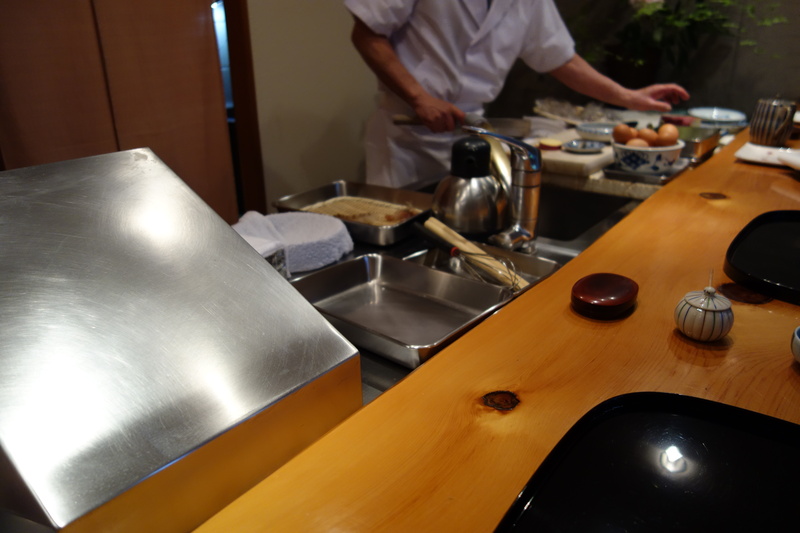 I did not react to the food viscerally, nor did the virtuosity of frying Asagi-san demonstrated translate into something that I would crave and remember long in the memory. 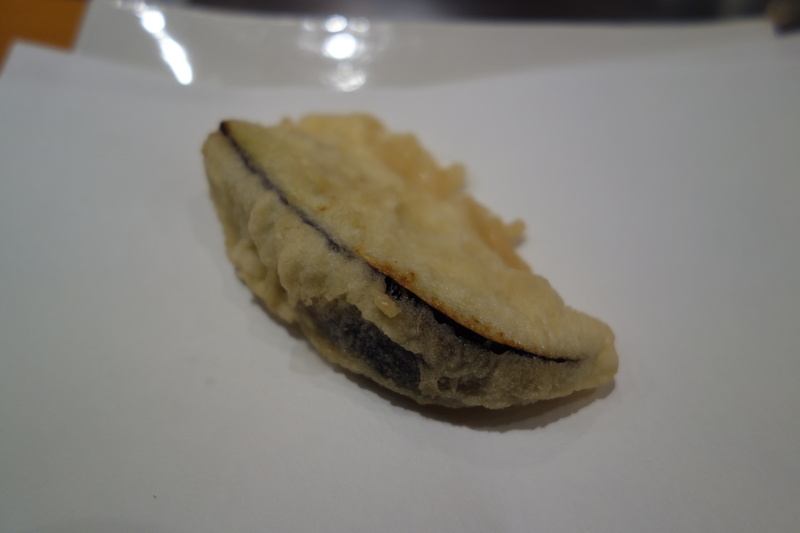 I’m not entirely sure I could differentiate properly between the high-end tempura of Asagi-san, and some of the cookie-cutter tempura I’ve enjoyed in Singapore and the States. 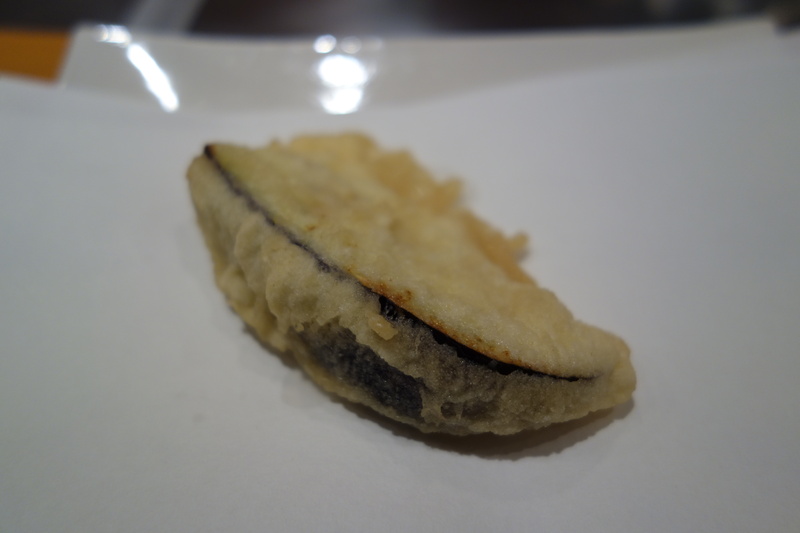 Asagi-san’s was notably not greasy, but the rest of the differences were so subtle I might be imagining them. 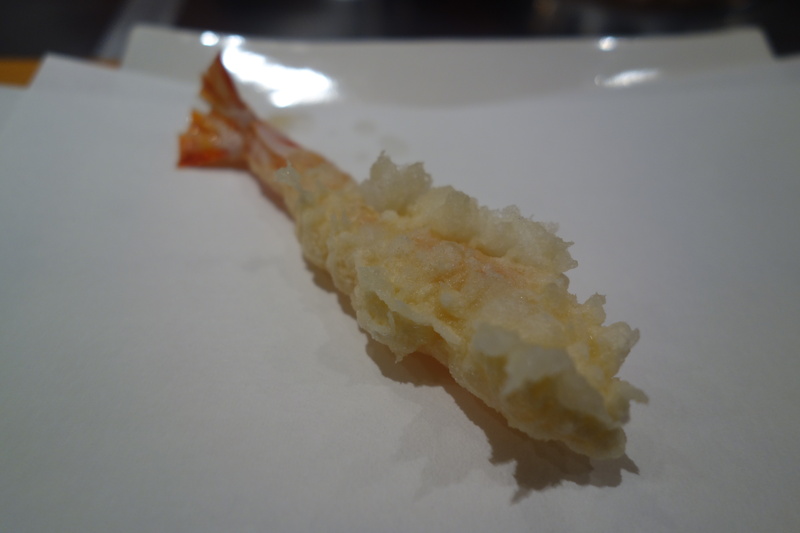 The previous dishes had lacked a savory element, the prawn heads here tasted like the South-east Asian anchovies, ikan bilis. 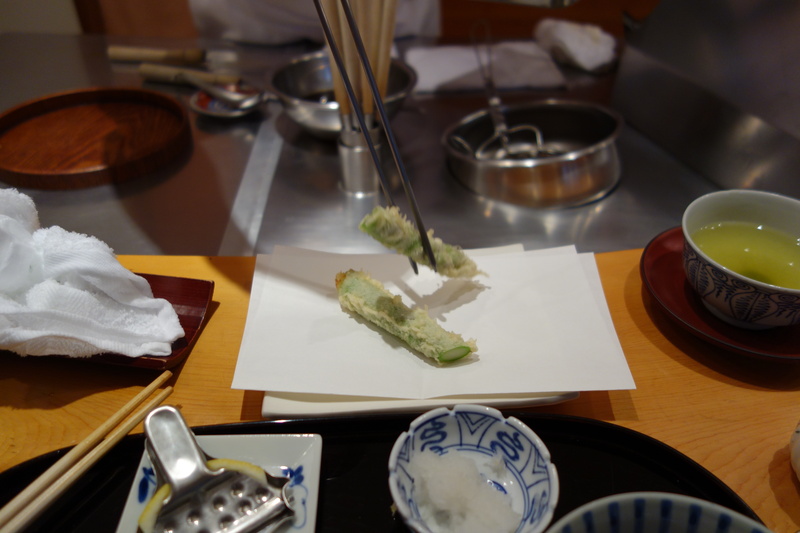 The slightly-bitter melon taste of the ayu head was again evident. 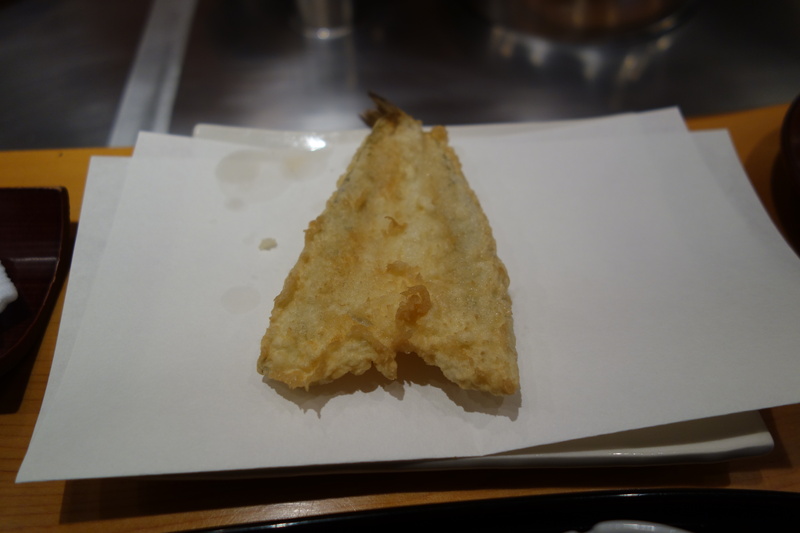 I first had ayu at RyuGin a couple of days ago. 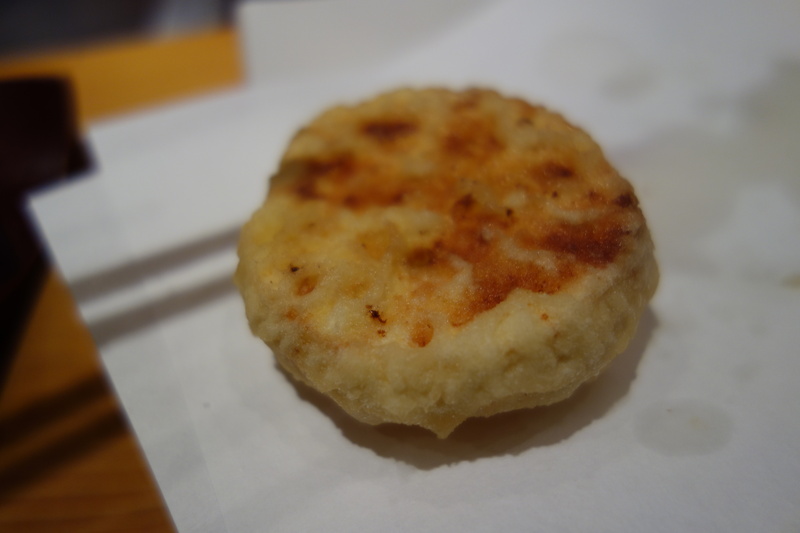 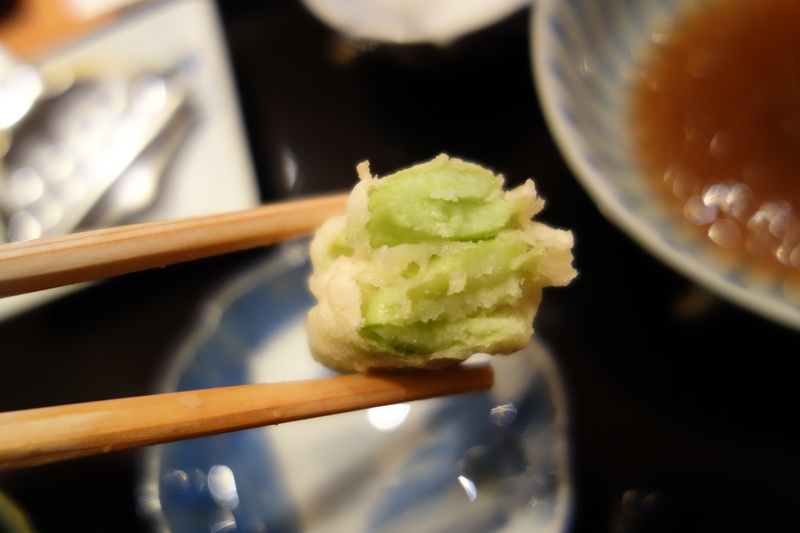 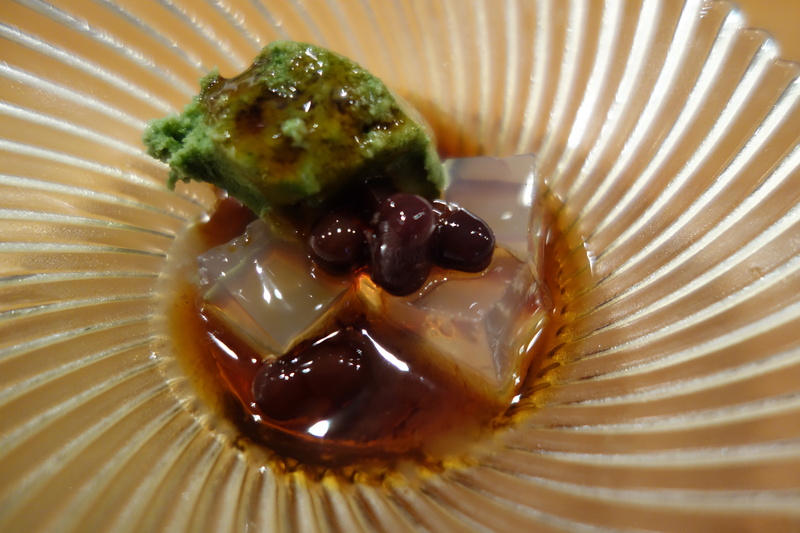 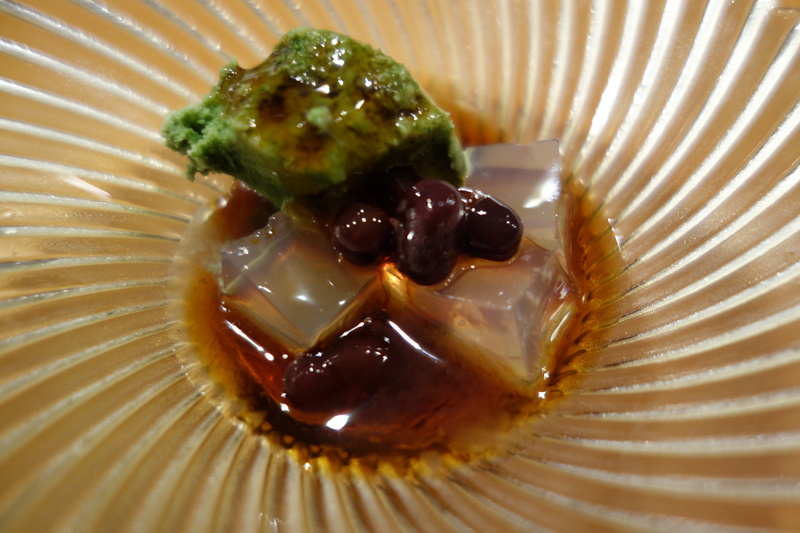 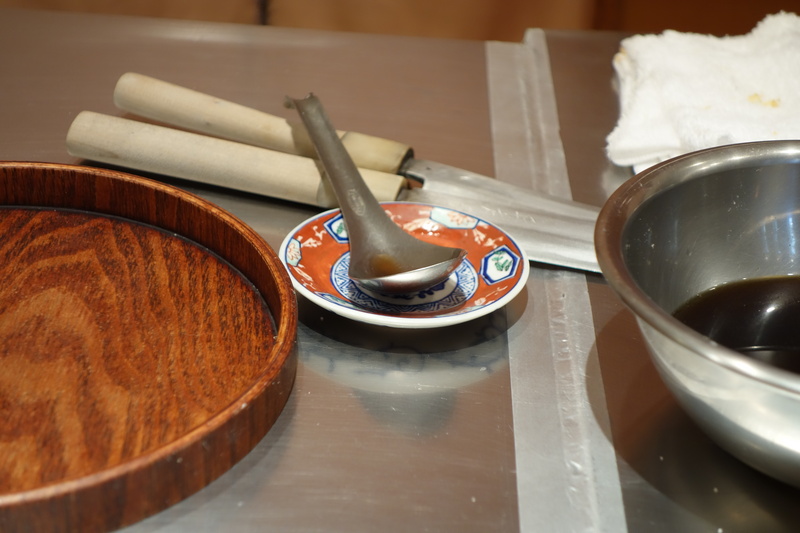 To stick the two beans together, Asagi-san used a toothpick, and laconically swirled them around in his tempura vat of oil for about 20-30 seconds. 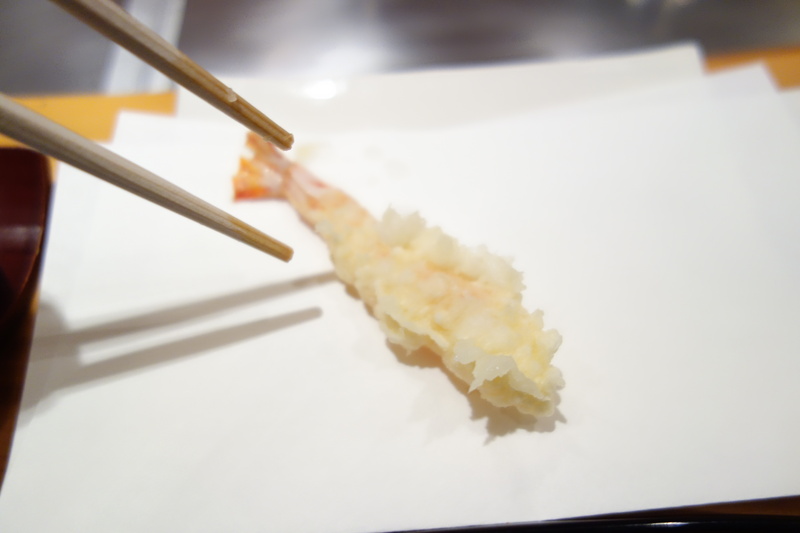 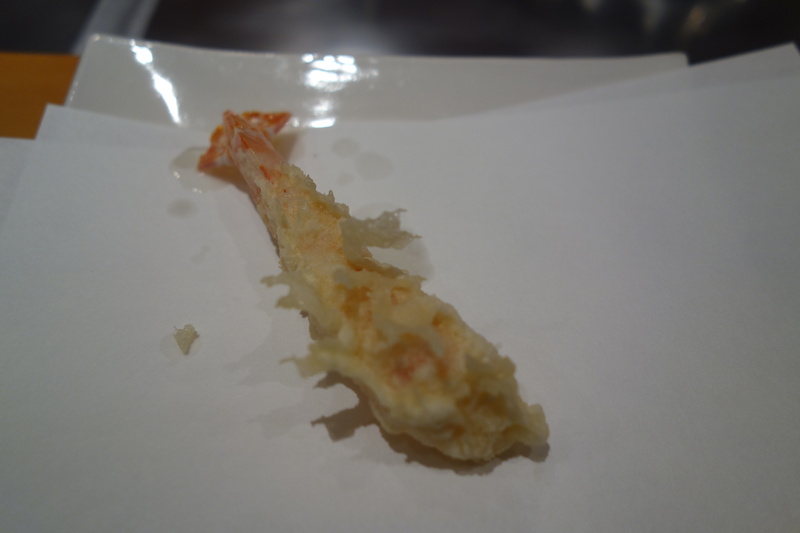 In preparation for the anago, I had a sour-salty prawn paste, and salt. 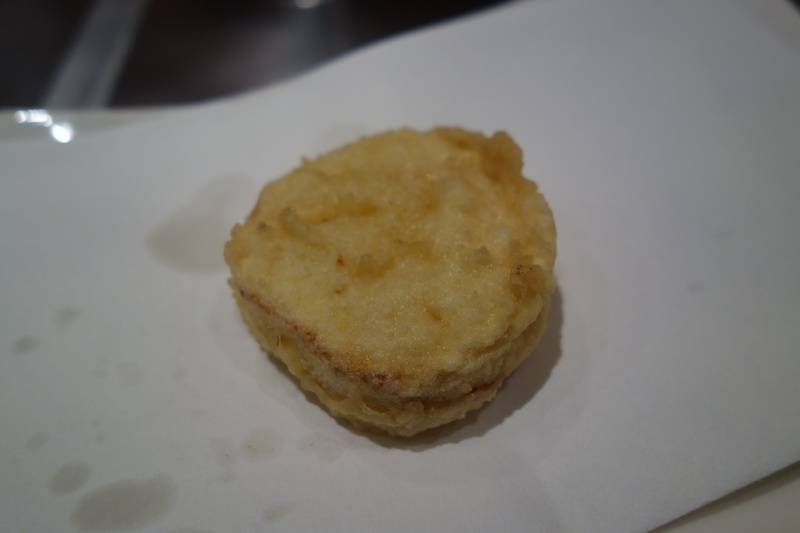 Very good, with prawn paste and salt. 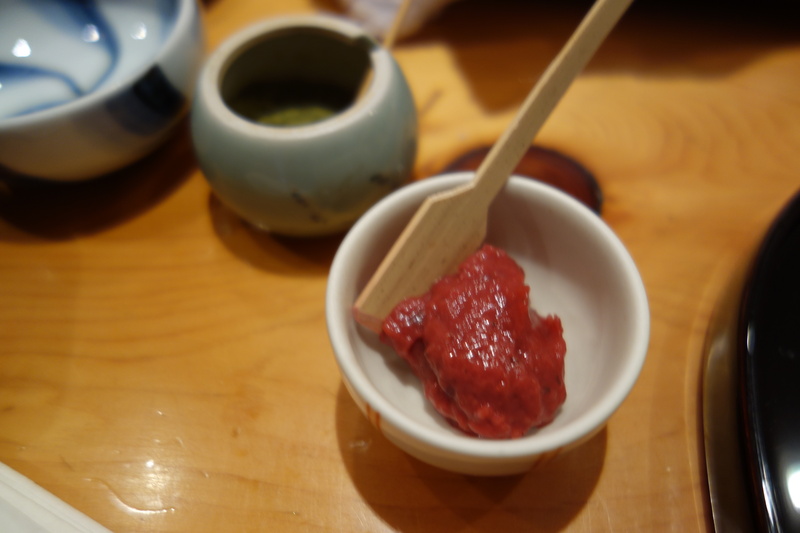 Anago became my favorite seafood in Tokyo, having had a revelatory sweet-sauce on it at Sushi Bun at Tsukiji. 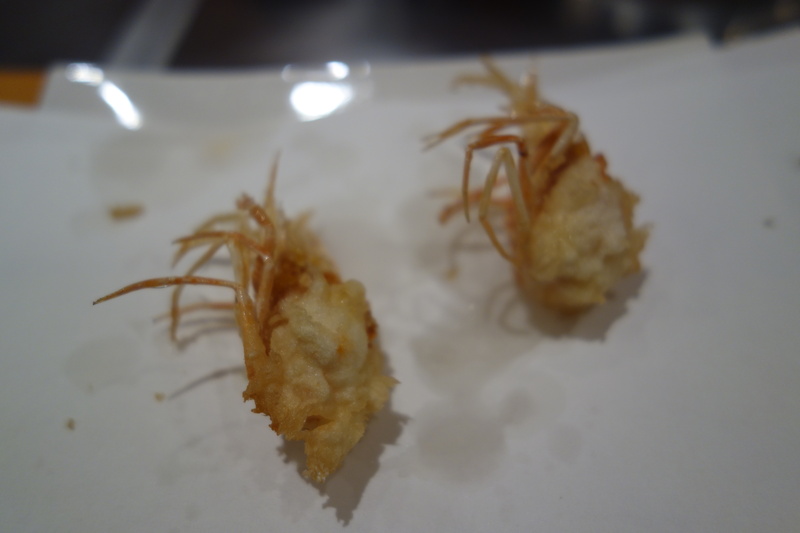 One of perhaps two dishes which stuck with me in the memory. 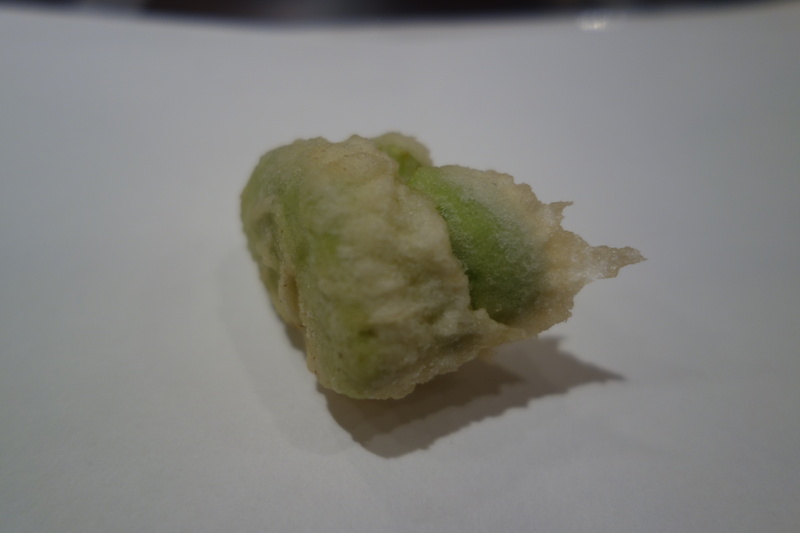 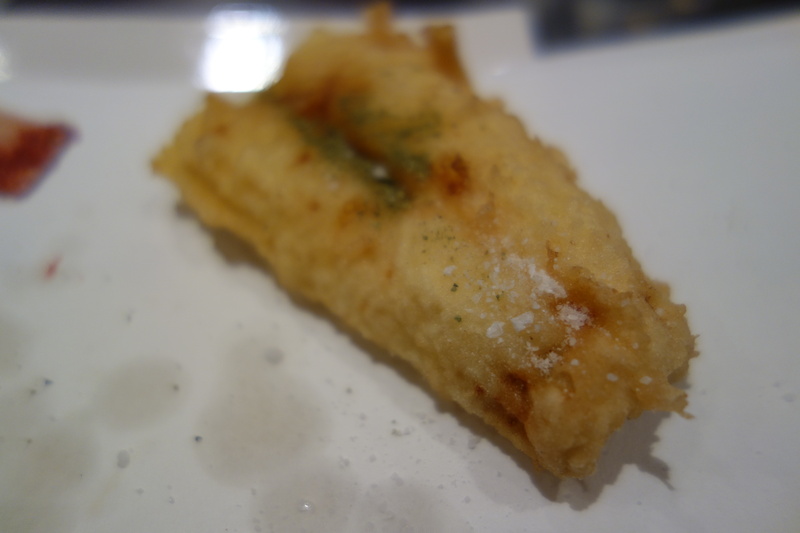 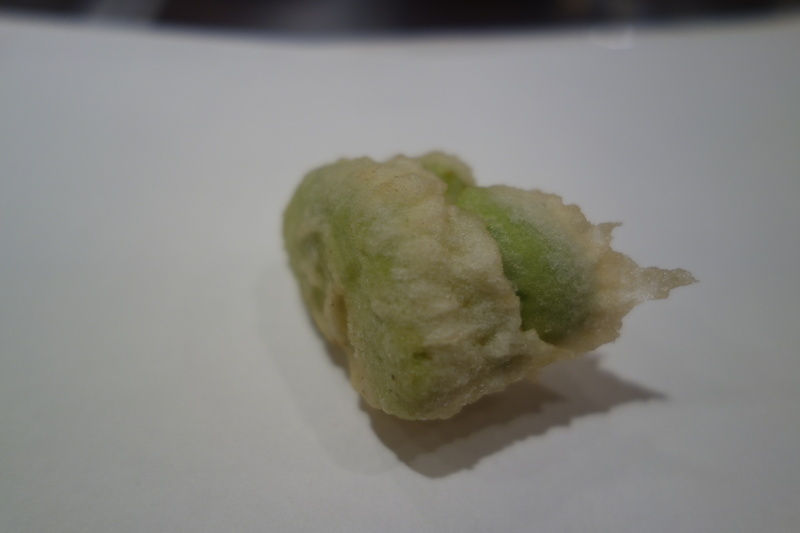 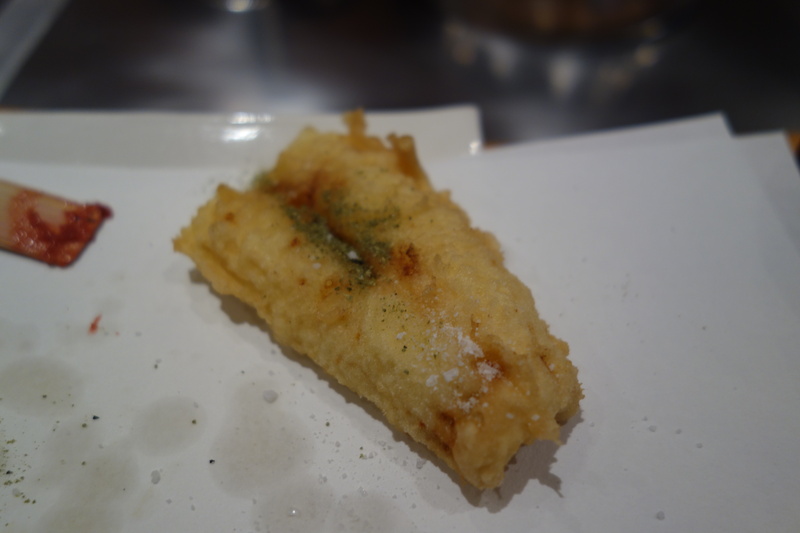 This tendon was fried as a single agglomerate, which takes a lot of skill on the chef’s part. 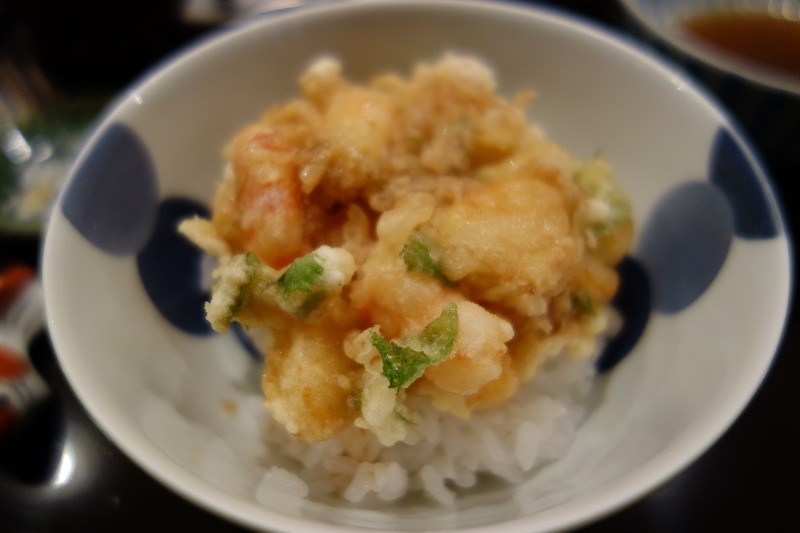 Drizzled with a sweet-savory sauce, this was absolutely addictive. 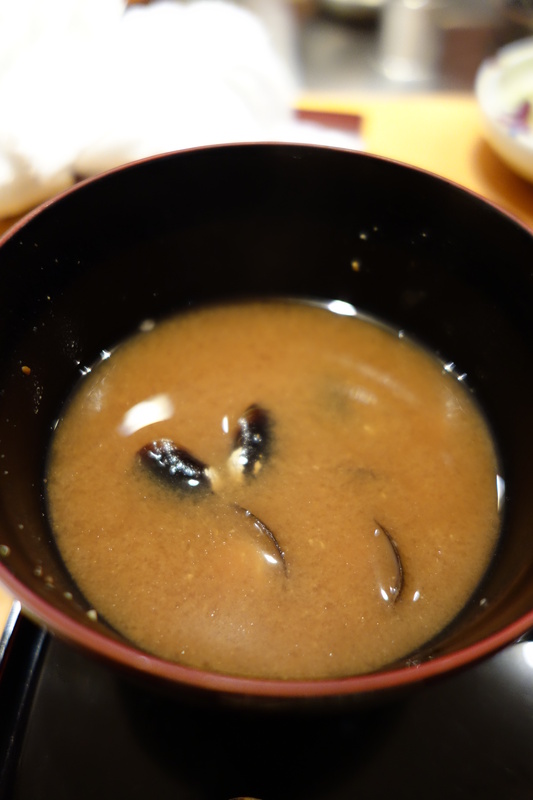 I could have had three to five bowls of this without question. 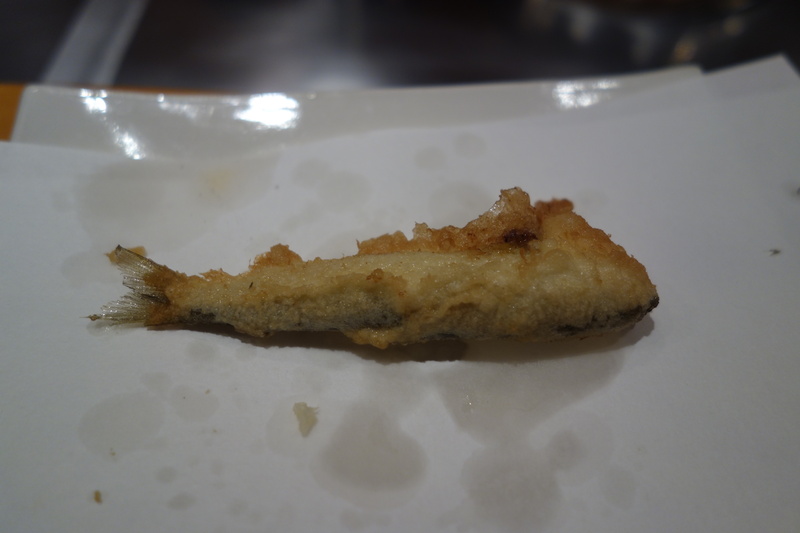 A most perfect and composed ending to a fried meal. 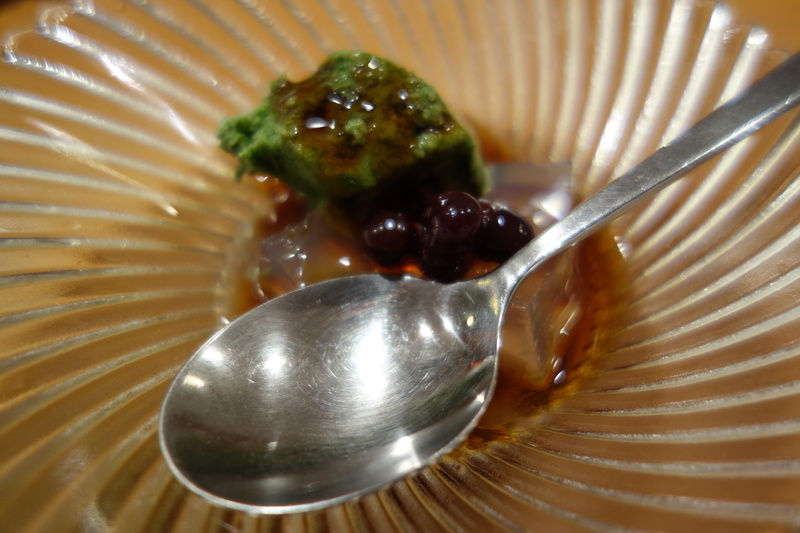 A delicious single scoop of matcha ice cream, with red beans, brown sugar, and jelly.